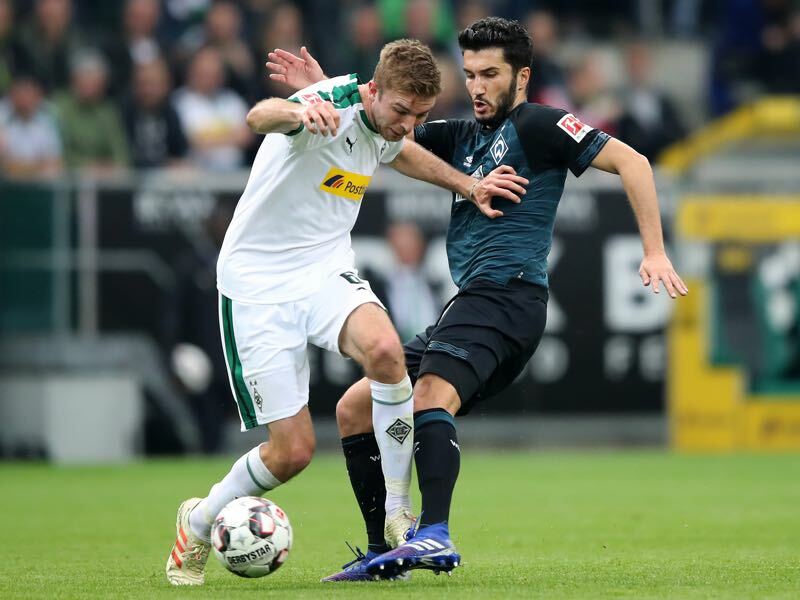 Gladbach v Werder — Borussia-Park, Mönchengladbach — Borussia Mönchengladbach and Werder Bremen couldn’t be separated in a 1-1 draw at Stadion im Borussia-Park. Florian Neuhaus put the foals in front shortly after half-time, Davy Klaassen responding by heading in Yuya Osako’s cross in the 79′ minute. Werder Bremen have scored in all 32 competitive matches this season. Borussia Mönchengladbach have not won in five home matches. Klaassen scores for the second consecutive match. Borussia Mönchengladbach started the brightest with Thorgan Hazard shooting wide and Raffael failing to control when through on goal. Patrick Herrmann combined with Florian Neuhaus, but his cross failed to find a teammate. Werder Bremen fashioned the best chance of the half when Max Kruse’s defence-splitting pass found Johannes Eggestein. The young striker had plenty of time to pick his spot but couldn’t beat Jan Sommer who stayed bug and produced a fine save. Business resumed at the other end with the hosts starting to dominate the match. Neuhaus shot over, and Denis Zakaria’s cross found Herrmann at the back post, his shot hitting the woodwork from a tight angle. Christoph Kramer earned the first booking of the match after taking down Milot Rashica to prevent a fast break. Herrmann shot over the bar, and a surging run from Zakaria resulted in Plea’s effort going narrowly wide. Hazard was next to see an attempt go wide of the post with the foals in firm control. Mönchengladbach had a penalty claim denied when Plea went down in box from what appeared to be a push in the back from Ludwig Augustinsson. Augustinsson was the next to earn a caution after a tackle on Herrmann. Space was opening up in the middle with the first half ending with Sebastian Langkamp’s effort from a free kick sailing over the bar. Florian Kohfeldt’s side continued to look for counter-attacking opportunities after the break, but one backfired in cruel fashion. Max Kruse slipped which allowed Matthias Ginter to release Neuhaus, the 22-year-old rounding Pavlenka before squeezing the ball home from a tight angle. Plea narrowly missed the top corner from a distance as Kohfeldt introduced Yuya Osako for Johannes Eggestein. Zakaria produced a great tackle on the Japanese forward but wasn’t as fortunate second time around, a mistimed effort earning the rangy midfielder a yellow card. Osako sent Klaassen through before turning Strobl, the substitute keen to make an impact in his first Werder appearance since 22 December. The visitors were exerting pressure with Max Eggestein firing over and Rashica shooting wide. Mönchengladbach had lost the initiative as Dieter Hecking replaced Herrmann with Fabian Johnson. Kruse then had a shot tipped over the bar by Sommer before the hosts spurned a great chance to make it 2-0. A defensive mix up saw Hazard one-v-one with Pavlenka, his shot was saved but fell to Johnson who fired a volley wide with the net at his mercy. It was then Sommer’s time to shine; a double save from Rashica and Kruse keeping his team in the lead. Johnson was heavily involved on the right win with his cross finding Neuhaus who fired a difficult volley over the bar. 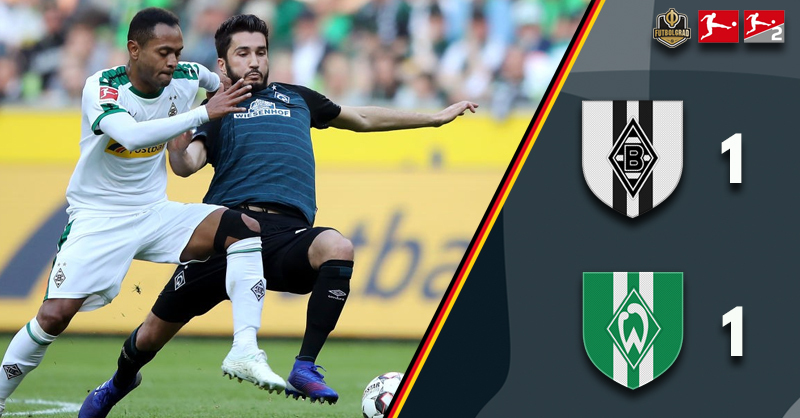 The game was opening up, and there was a concern Werder might tire after their midweek win in Schalke, Nuri Sahin making way for Claudio Pizarro. Neuhaus combined with Johnson before shooting over as Jonas Hofmann replaced Raffael. Just when it appeared that Werder’s incredible scoring streak might be broken, an Osako cross found Klaassen who headed an equaliser past a helpless Sommer. Rashica shot at Sommer as Hecking brought on Lars Stindl on for Neuhaus and it was the hosts that finished stronger. Ginter headed a corner wide before testing Pavlenka from a distance, Hazard with the final chance with Pavlenka up to the challenge once again. Christoph Kramer was an unused substitute in the 3-1 defeat at Fortuna Düsseldorf but returned to the starting XI here and was influential throughout. A key early challenge set the tone with the World Cup winner running the show from the holding midfield position. Kruse used his positional sense and passing range to good effect, kept a watchful eye on Max Kruse and made a game-high five tackles. Borussia Mönchengladbach have now gone five matches without a home win in the Bundesliga after winning their previous 12 games at the Stadion im Borussia-Park. The foals were in a good position to claim the win but couldn’t keep a clean sheet, Werder Bremen scoring in their 32nd competitive match this season. It was the 100th meeting between the two sides. In 2019, only Werder (six wins, seven draws) and Eintracht Frankfurt (nine wins, six draws) have not lost in Europe’s top five leagues a single competitive match.